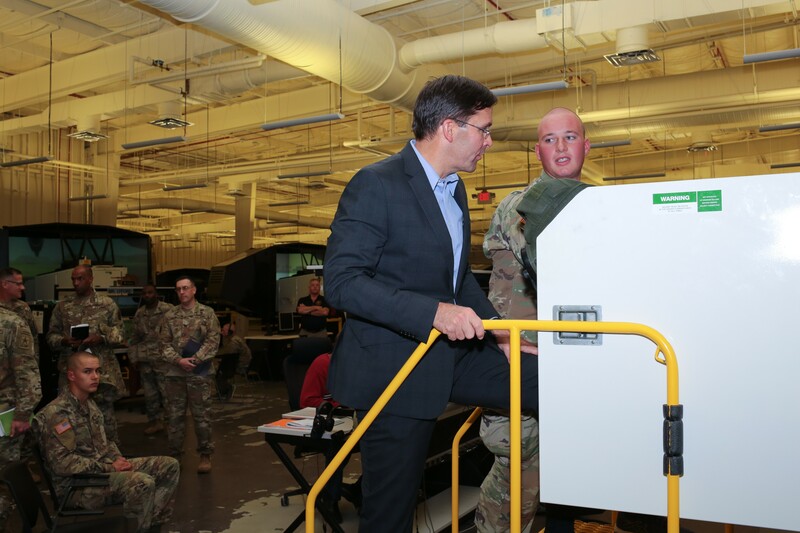 FORT BENNING, Ga. -- Secretary of the Army Dr. Mark T. Esper held a town hall meeting with Soldiers, civilians and Family members at the Maneuver Center of Excellence headquarters, Nov. 16. While touring Fort Benning, Esper visited the Soldiers at the transformed One Station Unit Training and took part in the forthcoming Army Combat Fitness Test with Maneuver Captains Career Course Soldiers and more. "These trips give me a chance to make my own assessment of what's going on in the Army and reacquaint myself with the Army," said Esper. Esper was an active-duty Soldier for 10 years, which included some time with the Ranger Training Brigade. "A lot has changed," said Esper. "Fort Benning, except for the jump towers, did not look like it did in the 1990s." Citing the ACFT and the 22-week OSUT as innovations important to the Army's future, Esper explained that while the Army will continue to be an Army trained to fight irregular warfare, the Army must also prepare for near-peer threats. "The Army is in a renaissance right now," he said. "There are a lot of things we're doing to reinvigorate the Army to make sure we are ready for that new era, to make sure our Soldiers are physically tough, mentally strong, and have the technical skills and tactical expertise to be successful on the battlefield." Esper elaborated more on these programs at a press conference later in the day. 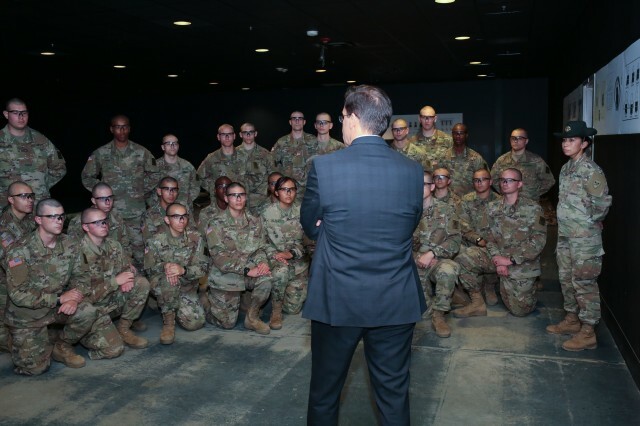 "We know the ACFT combined with the extended Infantry basic course will allow us more time to prepare these Soldiers for the demands of their operational units and help us prevent injuries, thus making Soldiers more deployable," he said. "I'm convinced that the ACFT is the right thing to do. Before I signed off on it, I took the test myself to make sure I understood it and its challenges." Esper also talked about the six modernization priorities, which the Army has based off what they learned from the conflicts in Ukraine and in anticipation of what near-peer competitors will be capable in potential future conflicts. 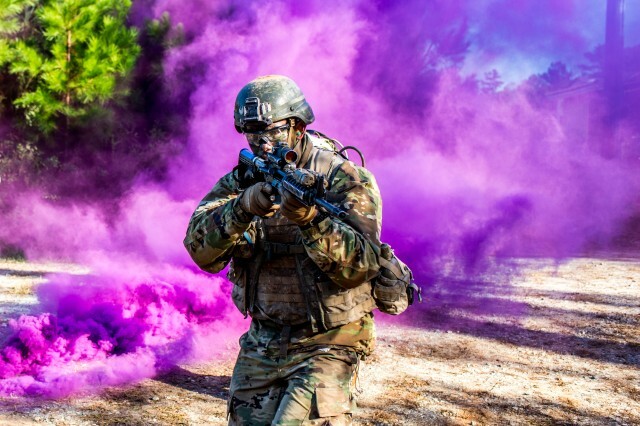 Those priorities include the Next-Generation Combat Vehicle and Soldier Lethality, the cross-functional teams of which are headed by the Armor School commandant and Infantry School at Fort Benning. "Those priorities start with long-range precision fires," he said at the press conference. "Next is Next-Generation Combat Vehicle, which will have a big impact on mechanized Infantry. And then it runs all the way down through to the one closest to my heart, Soldier Lethality." Esper cited a few of the concrete changes to emerge from Soldier Lethality, including enhanced night vision goggles, a prototype of a weapon that has greater range, greater accuracy, and more power than the M4 carbine. The Army is aiming for a prototype of the Next-Generation Combat Vehicle, which is set to replace the Bradley Fighting Vehicle, to be fielded around 2026. In order of importance, readiness, modernization and reform are the Army's focus priorities, according to Esper. Reform, the third priority, is about "freeing up the time, money and manpower to put back into number one and number two," he said during the town hall. These focus priorities are in addition to the "enduring priorities" of taking care of Soldiers, Department of the Army civilians and Families. They are about building strong alliances and partners and recommitting to the Army values. "The Army values -- the Army ethics -- have held us well as a profession for many, many years in this institution," said Esper. Esper took questions from the town hall. Topics ranged from maintaining proficiency in the irregular warfare, the continued role of the infantry in possible near-peer conflict involving significant stand-off, to the training for urban warfare. One question addressed the state of civilian-military relations, to which Esper talked about recruiting strategies and communicating the military's story. "Fewer and fewer Americans today -- young kids today -- have family members who served, so there's less familiarity with military service and what it means and all the [references] it brings and all the opportunities it presents," said Esper. "The risk is, we become a subsector of the culture of the country that is further removed from the broader key populace we serve... We need to try to reverse that and go after that problem." 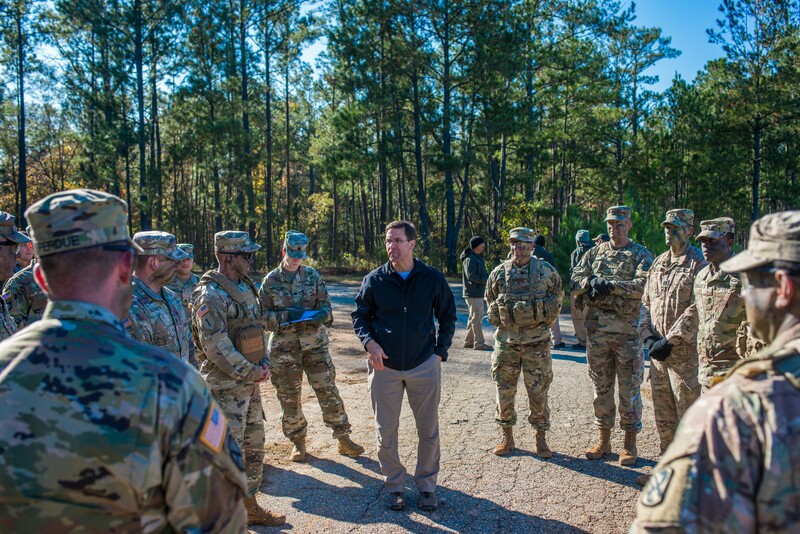 On Fort Benning's relationship with Columbus and the Chattahoochee Valley community, Esper was pleased about the communities' relationships with one another, and saw a positive future for both the Army and its neighbors. "From my earliest days, there has always been a great deal of community support from Columbus and the adjoining areas," he said. "Your Army is doing great things. I'm very excited about our future. 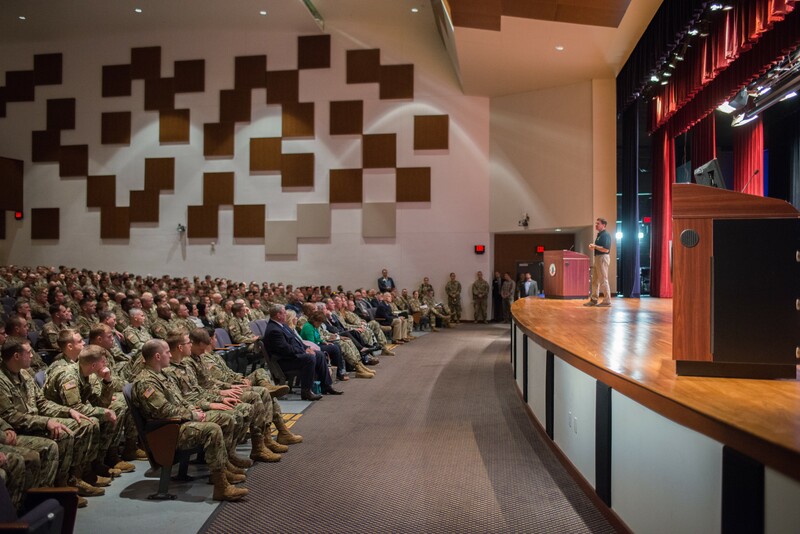 We have great leaders down here at Fort Benning and we will continue to do well by you and by the American people." Esper's wife Leah also visited Fort Benning, and her visit included an overview of the Directorate of Family and Morale, Welfare and Recreation, a windshield tour and walkthrough of historic and new homes, a discussion of spouse hiring with Army Community Services, and more.